Application Deadline Prospective applicants must submit a proposal for reimbursement to their respective Forest Fire Service Division Office or Trenton Headquarters between January 1, 2017 and December 31, 2018. Notification Date Notification of award will occur within one month of the end of the application period listed above. Meeting the National Cohesive Strategy goals for Wildfire Risk Reduction. conduct outreach and awareness activities in the community. 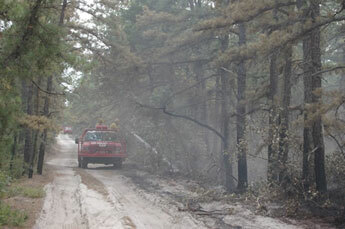 USDA Forest Service- through the National Fire Plan. NJ counties, municipalities, and homeowner associations. Communities located in documented wildfire risk areas that have met the criteria for Firewise Communities/USA designation. Funding is limited to half of the project cost, up to $5,000. A description of the project and a “Proposal for Reimbursement” are required for an application to be considered. Applicants shall also complete form AD-1048, Certification Regarding Debarment, Suspension, Ineligibility and Voluntary Exclusion – Lower Tier Covered Transactions,” available at https://forms.sc.egov.usda.gov/efcommon/eFileServices/eForms/RD1048.PDF. Applications may be submitted at any time within the period listed.